Alura dress is new release from EvelinInThe Box. This dress have 5 set of Flowers,Lace, Linen, Oriental and Plaid. And offers 10 colors dress via HUD. Rehana worn Linen. Also too Tattoo is new release from Corol G underboobe tattoo, Clock, Eyes, Heart, Owl, Tribe 5 patterns are the simultaneous release. Rehana worn Eyes. + Dress | EvelineInTheBox – Alura (Linen) – NEW!! Catherina Irish Gown is new release from Glam Dreams. This gown is Included 5 sizes standard Fit Mesh, Belleza, Maitreya snd SLink. I worn Mesh of Maitreya. 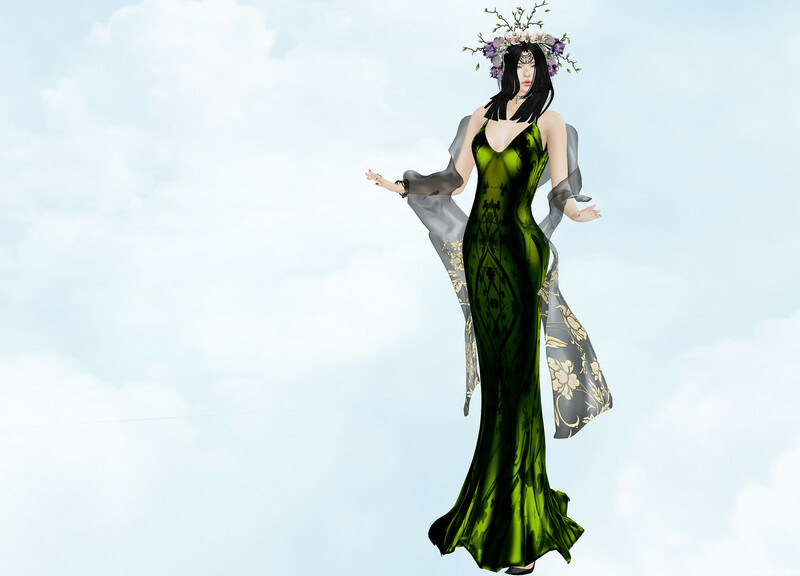 + Gown | Glam Dreams – Catherine Irish Gown (for Maitreya and more) – NEW!! Uriel Outfit is new release from Masoom in Uber. It’s a Set of Camisole and Pants. And Assassin Tattoo is new release from White~Widow in Shiny Shabby. I introduce Winslet Outfit is new release from JUMO. This outfit have dress, shoes and (I’m not wore here for this) Jewelry. It Jewelry is check in store. And, Lip is new release from JUMO, too. I wore classic avatar, but it have Appliers of Mesh Head. Please check it in store. + Outfit | JUMO – Winslet Outfit – NEW!! + Make | JUMO – Glosy Lip (Blood) – NEW!! Kim Outfit is new release from Elegance Boutique. Rehana wore color is top fushia and skirt pink. + Outfit | Elegance Boutique – Kim (Fuschia / Pink) – NEW!! + Make | JUMO – Liquid Lip (Coral) – NEW! !